has led to an actual quilt inspiration. I also had a stack of 2 1/2 x 5-inch rectangles left from the "Splash" Bali pop and I wanted to make a star block, put it on point, and create corner blocks with the mini triangle cross hatch blocks. I think I have it all figured out with a little help from my EQ 7 program. I am so proud of myself for actually thinking to use Bonnie Hunter's tool for making HSTs. I think Kinley will be the first to get in the shower. She does not want to look at me. Not volunteering to go first. I have been on task! It is such a great feeling to finish two big quilt tops. Both projects had lots of piecing with many points to match. My first Bonnie Hunter mystery, "En Provence," was a great little challenge. I used the specialty rulers Bonnie recommended for her design. Her ruler, the Essential Triangle tool was used to make all the half square triangles and the quarter square triangles. Her ruler was great and I need to remember to use it for my own designs. Bonnie used Tri Recs rulers for making the "triangle in a square" sections, also a great set of rulers. 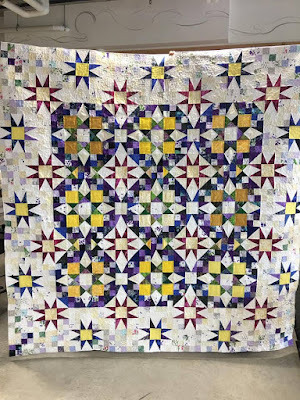 For years I have read Bonnie's blog and she spends lots of time emphasizing the accuracy of the quarter-inch seam in piecing...I totally understand her constant harping on this necessity. When I started putting everything together it was really amazing how often I basted a row where all the points were meeting and it was good without fixing before I put in the final stitching. I'm pretty much a stickler for my points being crisp so what a relief to have it all come together so nicely. I did make my version, "Le Tour de Provence," smaller, twelve blocks instead of 16. Kudos to all those quilters who did her original size. I saw some really great versions of this pattern in the blogging world. The quilt below is one of my favorites and I would have done this if I had seen it earlier. 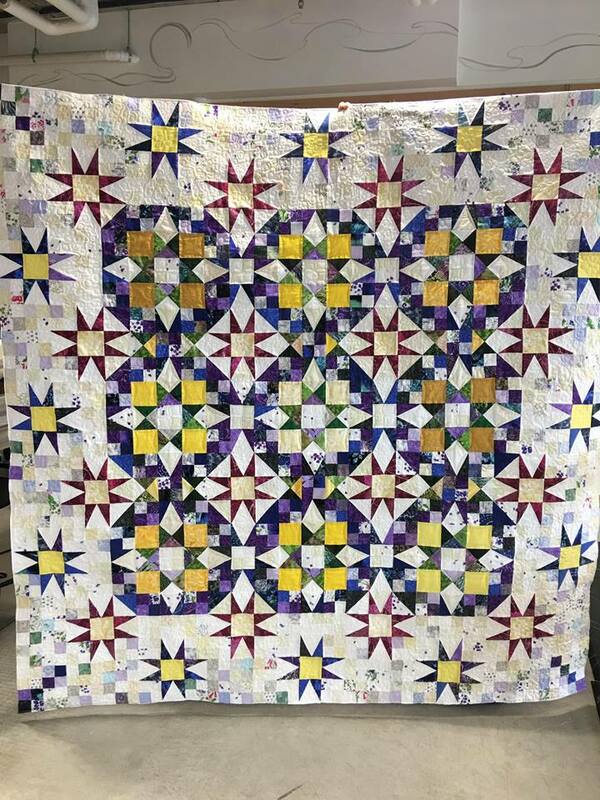 This is Jane Klotz Gephart's version as seen on the facebook page of McTavish Quilting Studio. Photo from McTavish Quilting Studio FB post. There are ways to simplify Bonnie's designs and I would take some of those steps if I were to tackle any of her designs in the future. I get that her niche is using scraps...I just don't have the scrap stash she has to fulfill the scrappy fabric designs...maybe after another 20 years of quilting. I had to order strips to make this design...that kind of defeats the goal of busting your stash for a quilt project. I think I would have had a comparable result with straight yardage in these colors...especially working with batiks like I always do. Our Breakfast Club mystery was another major piecing project. I also made this mystery smaller, 35 blocks instead of 80...yes...80 blocks in the original design. I think 42 blocks has been the largest finish so far from our group of Breakfast Club quilters. I made my own border design, a variation of piano keys, to follow the layout of the blocks with the 1/2" charcoal sections. A great way to use up many of the 2 1/2 x 5-inch pieces I didn't want to make into more blocks. I used a "Splash," Bali pop and Bali cracker with the Hoffman 1895, "Blacklight," which is more like a charcoal color, as the background fabric. Here's a reminder of the original design Marcia used to create the mystery, "Meadow," from the book, "Moda All-Stars Scraps Made Simple." Marcia made her version in bright batiks with a dark background and encouraged everyone to swap bright batiks for a truly scrappy look. I was on the fence about participating in the mystery since winter driving is a bit challenging in December but the quilting goddess cleared the streets so I was able to make the session...though I didn't take part in the scrap swap. I am getting a reputation for creating little designs with my leftovers from trimming the corners of the blocks where a 2 1/2-inch square is sewn on the diagonal of a block corner. I get a 1 3/4-inch half square triangle that finishes as 1 1/4-inch...tiny little devils...but they have become a bit of an obsession. Here's what I am doing so far with these scraps...making little blocks that will finish at 3-inches. First...a bit of news from March. I almost forgot to share the birthday present my son, Zack, gave me. We landed on Spencer Glacier...way up on the peaks of the Chugach mountain range. Our weather was perfect; sunny and no wind! The snow was almost waist deep powder. We are standing on the snow that the airplane skis packed down when we landed. Three of my son's friends also landed on the glacier with their airplanes. This photo was taken from our airplane parking spot. If you click on the photo you will be able to see the black lab dog one of the couples brought in their plane. A pretty unique outing for private planes. My son spent a summer working in Denali National Park, flying tourists around Denali and landing on the a glacier there so he has lots of experience with this kind of flying. We patiently waited for a great day for our trip. I also wanted to share a picture of a quilt I donated to the orphanage my father spent a few years in when he was a wee boy. The Methodist Children's Home in Waco, Texas, has an annual craft sale to raise money through their alumni association. I have donated quilts every now and then. It is getting easier for me to let go of my quilts. The blocks in this quilt were part of a Thangles sampler through a local quilt shop. I came up with my own layout to include the six new star blocks I added to the layout. It was one of my first longarm quilting endeavors which I loved at the time but now I would do things so differently! I did get the red snappers installed on the fabric leaders of my quilt frame. I have loaded the backing fabric for my next project...it was so much easier than pinning! I still pinned the quilt top bottom edge to a fabric leader. I'm waiting for about a three hour block of time to get the batting in place and baste everything together. I absolutely cannot leave anything hanging down when I leave the room or my cat might attack it. My most exciting quilt related news is the new books I bought from one of my favorite longarm bloggers, Margaret Solomon Gunn. She self-published these two books and they are fantastic!!! You can check out the books through her website here. Our cat, Eli, likes to spend time in the dog run. I haven't managed to get a photo of both dogs and the cat on the dog bed together. Every once in a while they all nap together peacefully. This is Kinley. Logan was inside napping.